I threw in a few parodies of Mondrian's paintings to get the students more excited and showed them the artwork made by the SHE students. On the second day, I put pre-cut construction paper (primary colored squares and rectangles and long black strips for lines) at each table and showed the students how to practice arranging the shapes to make a composition and glue them in place. 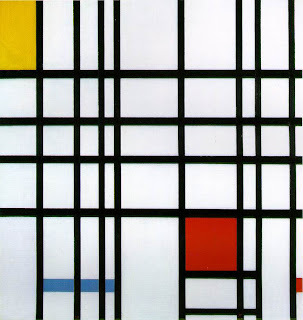 I explained to the students that we were using the same elements as Mondrian but making unique pictures with them. I learned that it worked better to tell the students to start with one shape of each color and THEN they could add more. I also made sure that some of the white paper showed and checked the practice compositions before giving the students a glue stick. Some students still ended up with like 5 layers of paper but they enjoyed the project and I was really pleased with the bold results. This was created by a 3rd grade student, much more intricate.